Summer Time, Ferry Time! 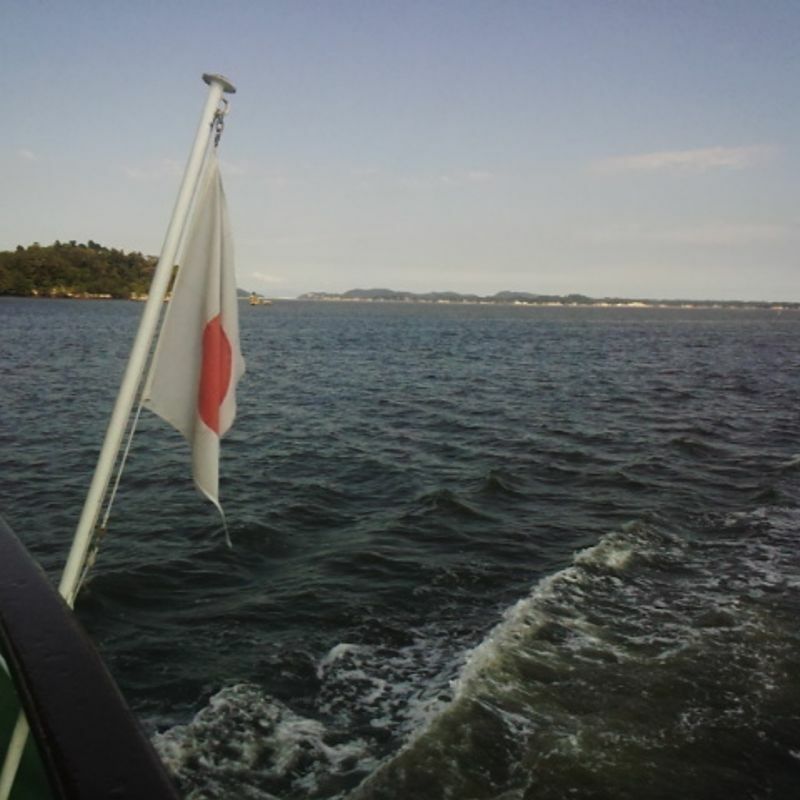 The Shiogama-Matsushima Route! 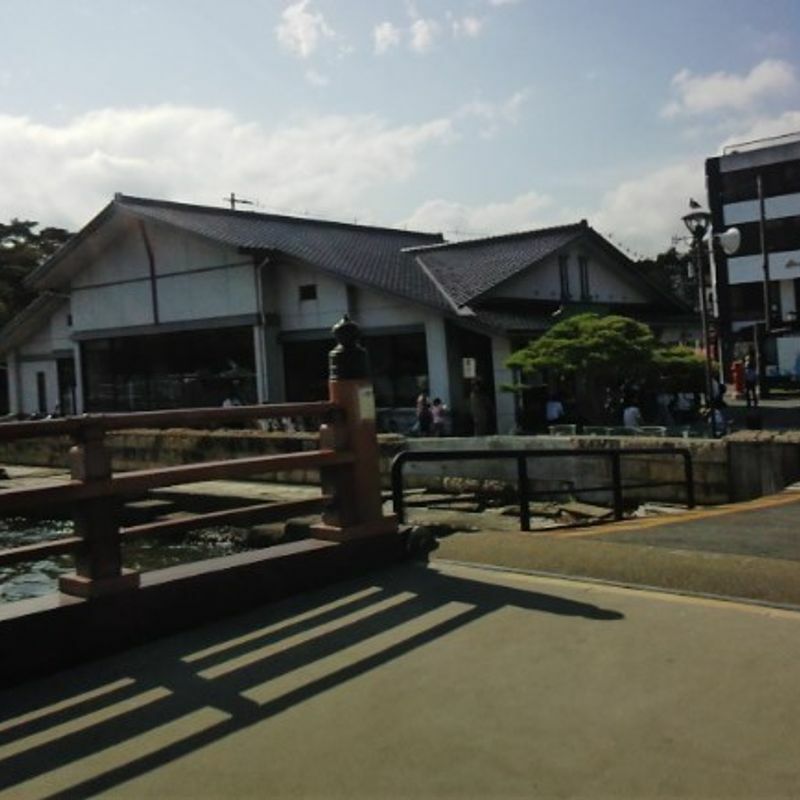 Taking the ferry from Shiogama's Marine Gate to Matsushima Kaigan is a great, scenic way to enjoy the natural beauty of Matsushima Bay. Tickets are 1500yen one way and boats run every hour on the hour until 3PM. Buy tickets at the desk, where the staff is kind but not always fast with the English, so it pays to know a little Japanese. They will hand you a ticket, remind you of the time of departure (and that you can board the ferry 10 minutes prior), and hand you a map. 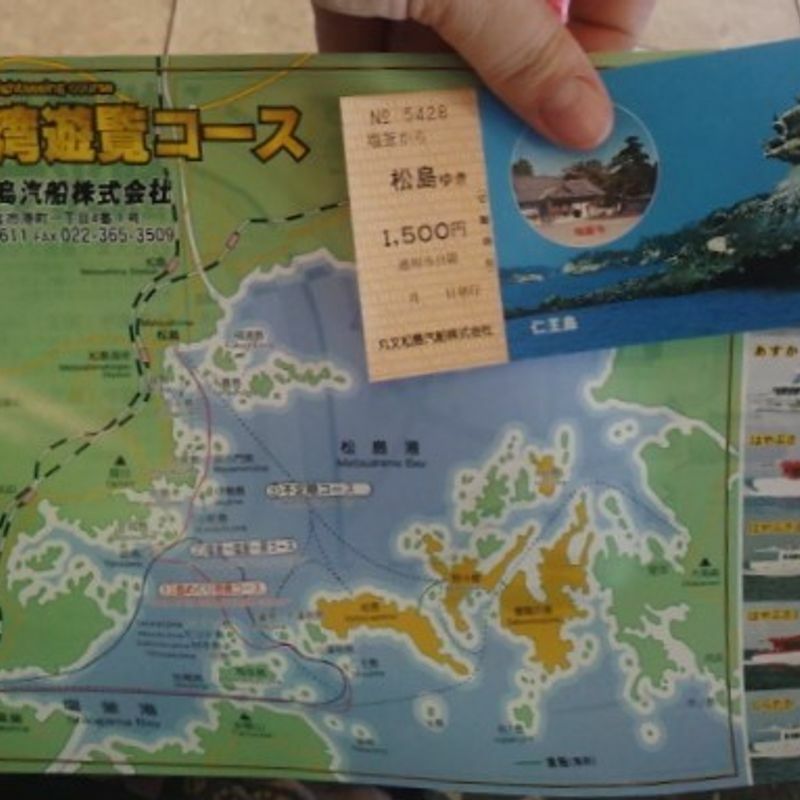 The map even has a picture of each ferry, and the staff member may point out the picture of the ferry you will take. 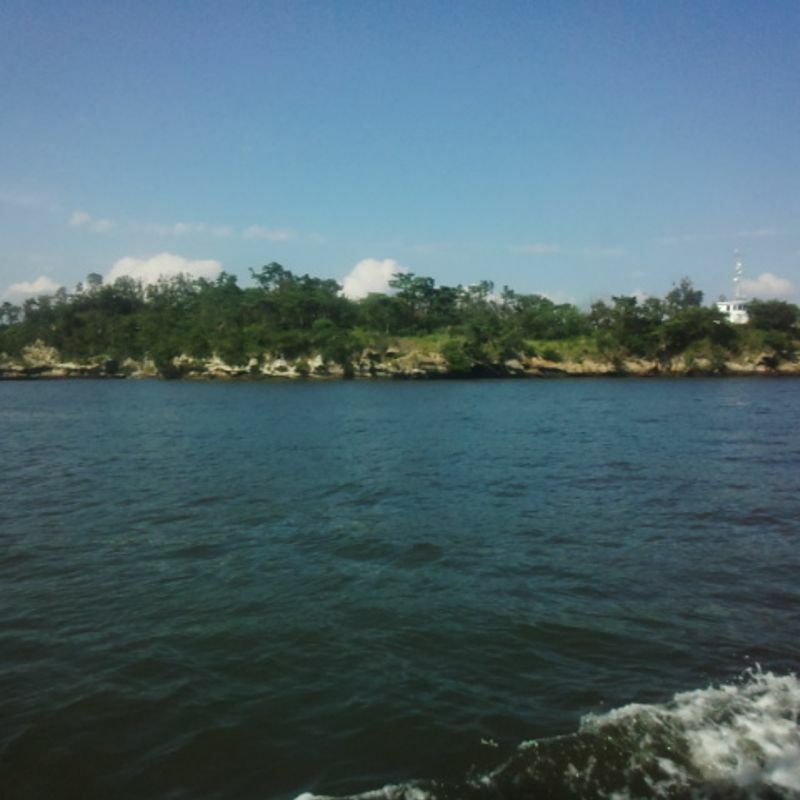 As I mentioned in my previous post, where I also explain how to get to Marine Gate, it is important to arrive early so that you don't miss the last ferry for the day. Since there is an hour between each boat, you might be left with some time to kill, but don't worry. There are a few things you can do. Here's the overall view from the top. See those cool little boats in the bay? Here's a video of me explaining a little about them a few days previous (hence the different colored shirt). Can you tell I like this place? 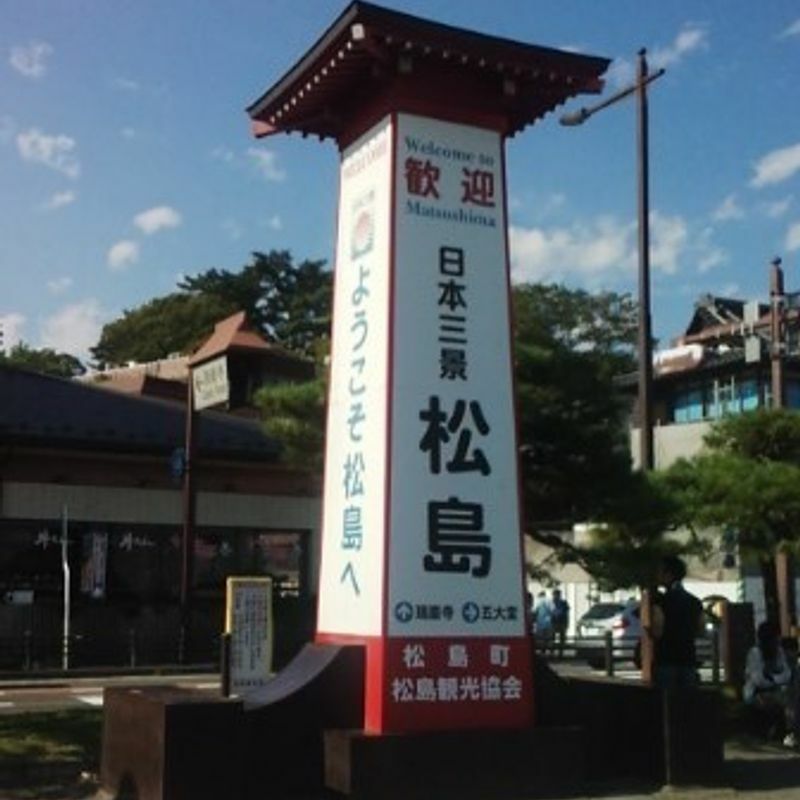 I really do usually march in the Marine Day parade in mid-July with the Shiogama International Friendship Club. Come out and see us next summer! Once you've had a look around, if you've still got time, I recommend checking out Bali Bali, an independently run shop that mixes weird, funny, (sometimes NSFW) t-shirts with fun east Asian imports. It's kind of like Spencer's Gifts meets Earthbound Trading Company, if you were a suburban American kid in the 90s. There is another souvenir shop just down from BaliBali as well as many other fish and seaweed related stalls in the same part of the building. If you're hungry while you wait, snacks and ice cream can be bought in the departure lounge while a bread shop and soba shop are just a few feet away. Coin lockers are also available if need be. When the time comes, or ten minutes before, go through the exit across from the elevators and find your boat! 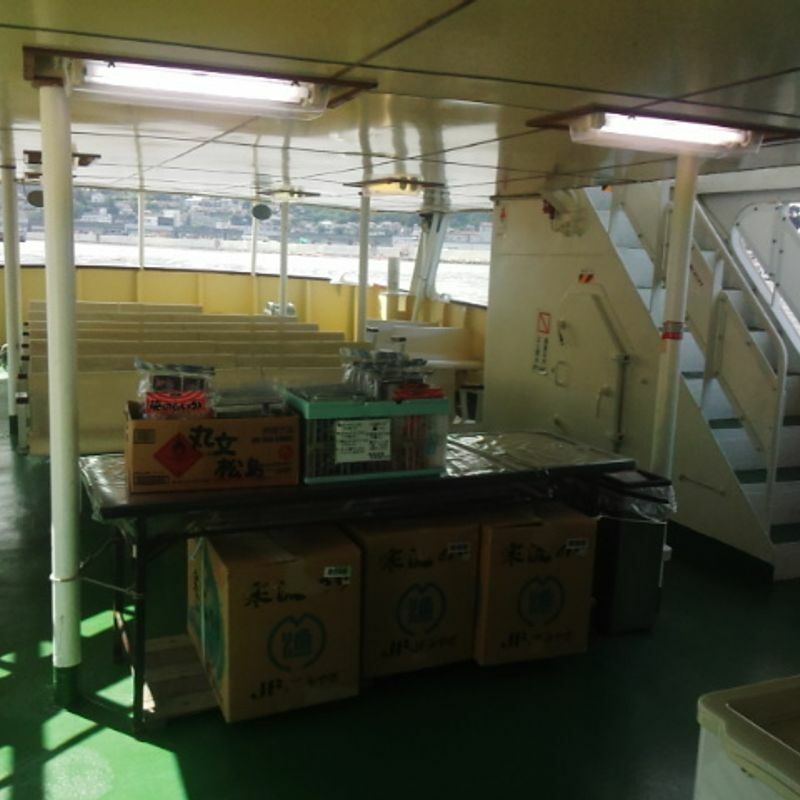 Most of the Matsushima ferries leave from docking space #3, so if you head for the three, you'll likely be in the right space. Cross the little red bridge, let the guys under the little green tent rip the perforation of your ticket, and board the ship! You can choose from the air conditioned inside, which is comfortable but surrounded by scuffed glass, or the outside, which is much warmer, but provides for photos that lack glass-glare and scuffs. The green table in the outdoor section is where you can buy seaweed and other specialty products from the nearby islands. 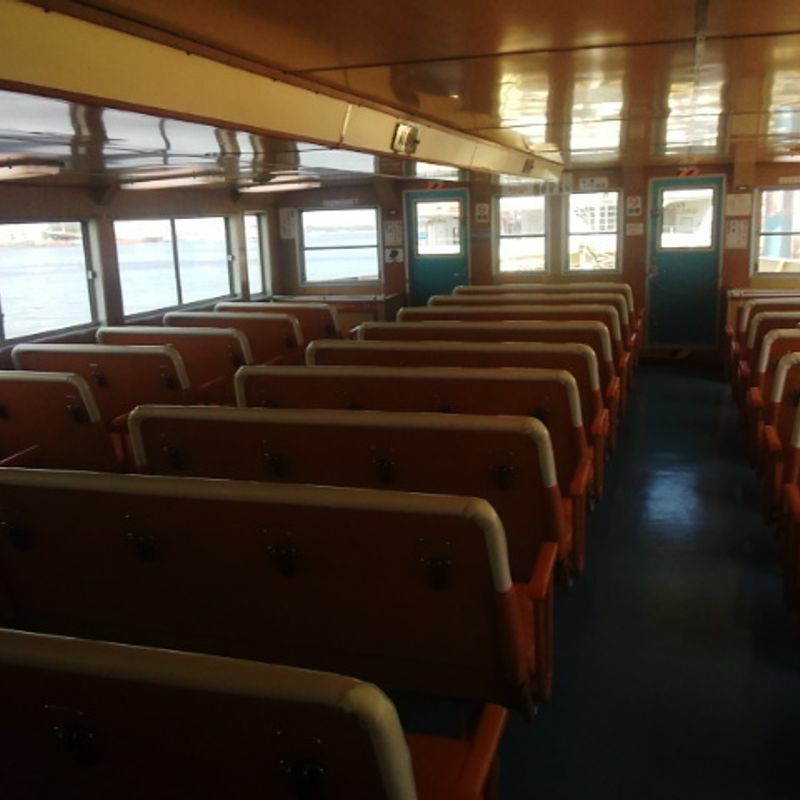 The staff who work on the ferries tend to be very sweet, talkative, and understanding. 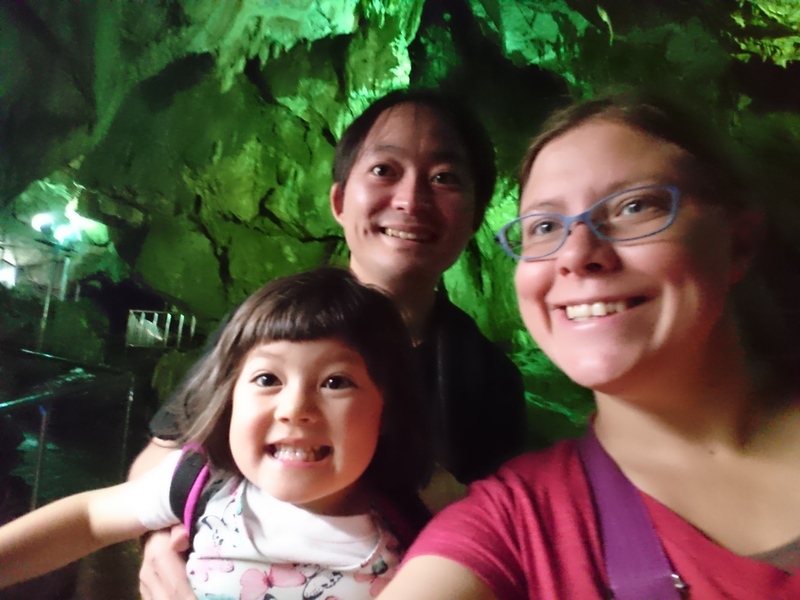 One even helped me keep up with my toddler on this expedition, which was above and beyond in my book. Also, if you're traveling with a toddler, I recommend buying a small toy from BaliBali so that the kid has something to play with when their mind wanders. This is mine with the baby octopus we acquired on our ferry day. 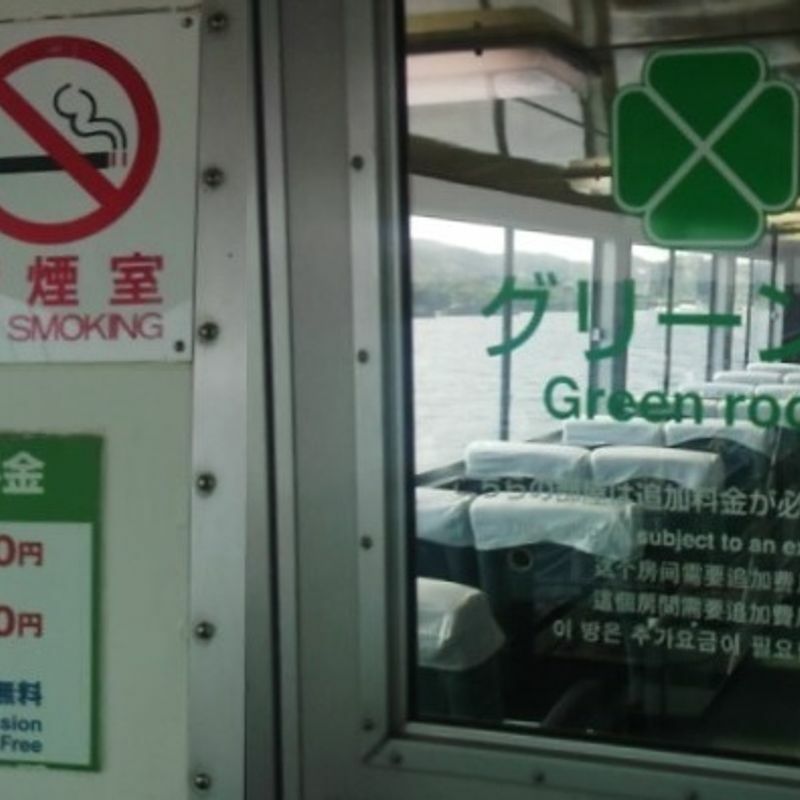 As the boat takes to the sea, you might be surprised to hear English on the overhead sound system. A pre-recorded guide plays, explaining the sights first in Japanese, then in English as read by a native speaker. Soon, the industrial sights of Shiogama's port fade into the distance, replaced with many terribly interesting islands and rocky formations. 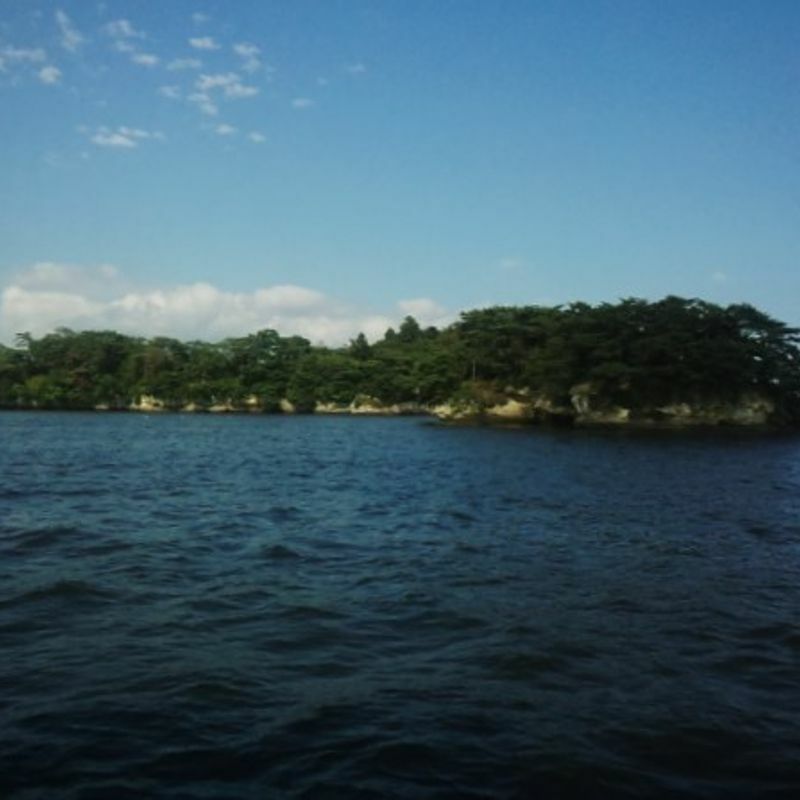 The first island you're introduced to was once the home of a political exile, or so explains the narration briefly. Other islands have other stories and other names. This island, known as Kanejima or Bell Island is so named due to the sound created by waves crashing against the striking gaps that make this island so distinct. One of the other most memorable islands is Niojima, said to resemble the Deva Kings of Buddhism or a monk or man, depending on who you ask. Unfortunately, I didn't get the best shot of this one, but personally I think it looks more like a duck. 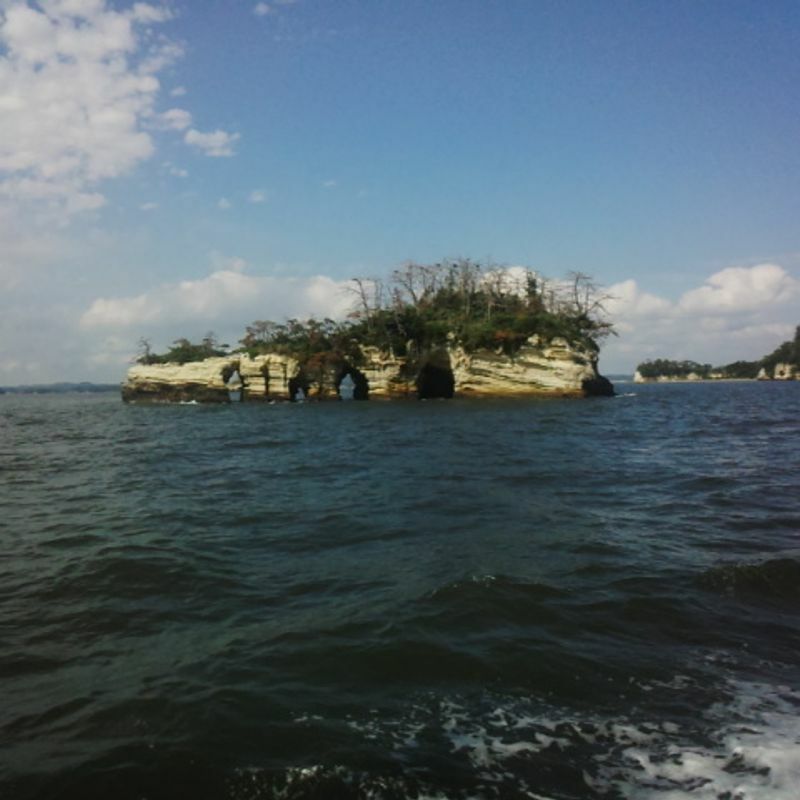 Regardless of the shape's personal interpretation, the island appears on many post cards sold in Matsushima, singularly or in sets. Even if the temperatures are high, I recommend taking a step outside for some better pictures and sea air if you have the chance. 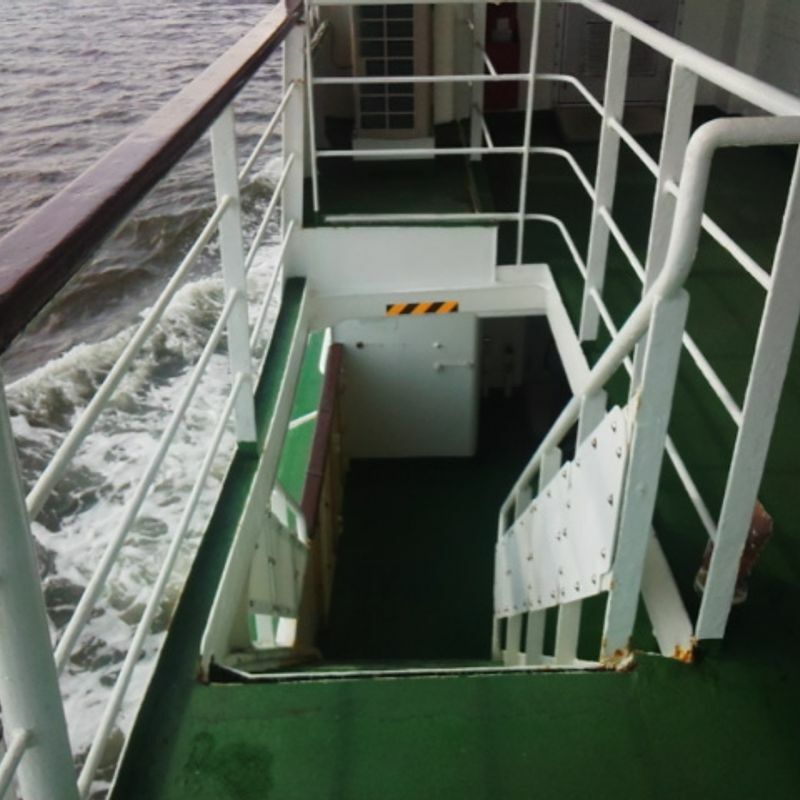 The upper deck of our vessel was open air, save for a Green Room, which required an extra charge. The highest level also required an extra charge for entry. 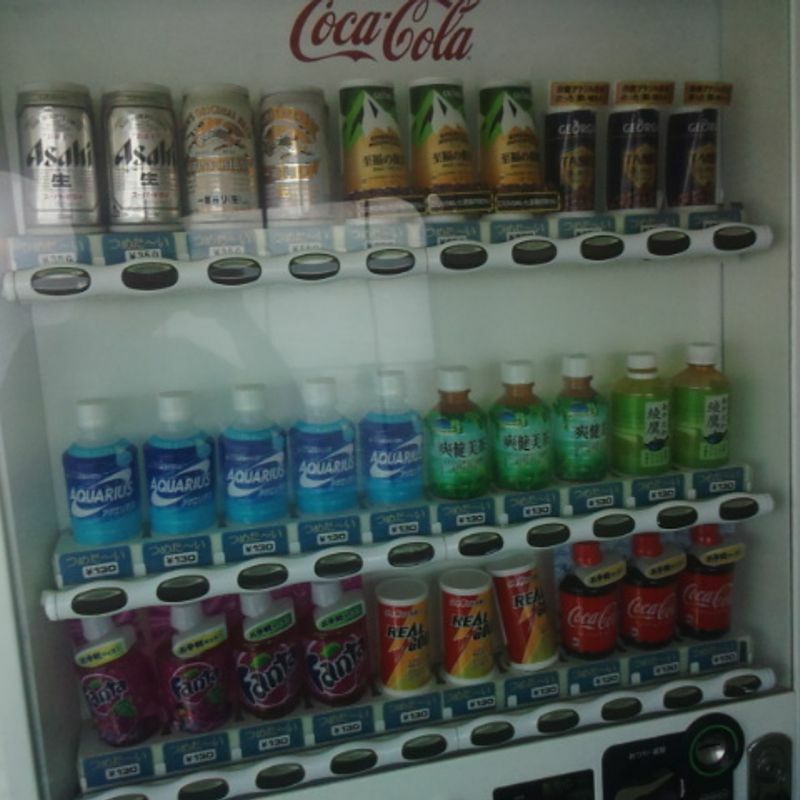 Beside the stair to the restricted third deck was a vending machine with many options, including beer. Whatever your chosen level of sobriety, please watch your head on the way down the stairs. I'm only 5'5 (165cm) and I almost cracked my forehead on that yellow and black stripe. Wherever you choose to be, remember to enjoy the view. 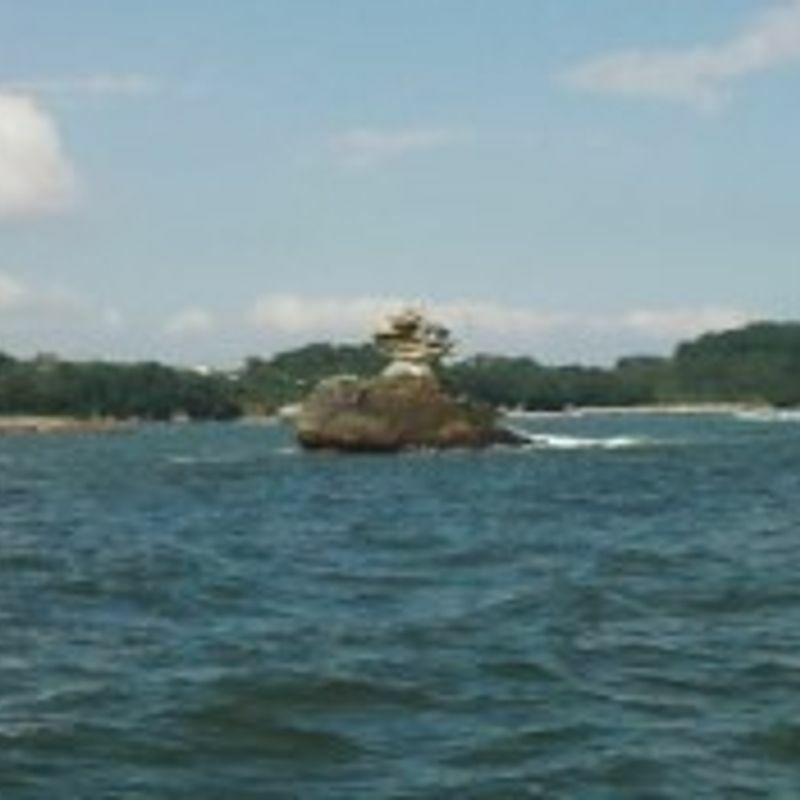 Because all-too soon, the fifty-minute cruise is over and Matsushima appears. On the right, you might see this. 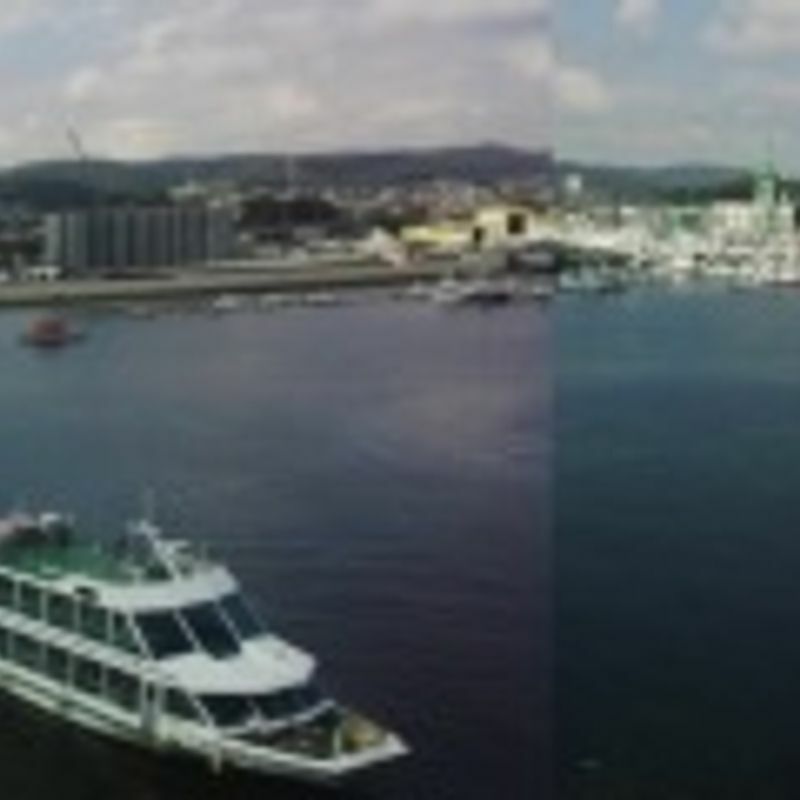 The long red bridge is known as Fukuura Bridge, Encounter bridge, and connects the mainland of Matsushima city to Fukuura Island, which contains a gorgeous natural park. Directly ahead, the roof of Godaido shrine stands above a cluster of pine trees. 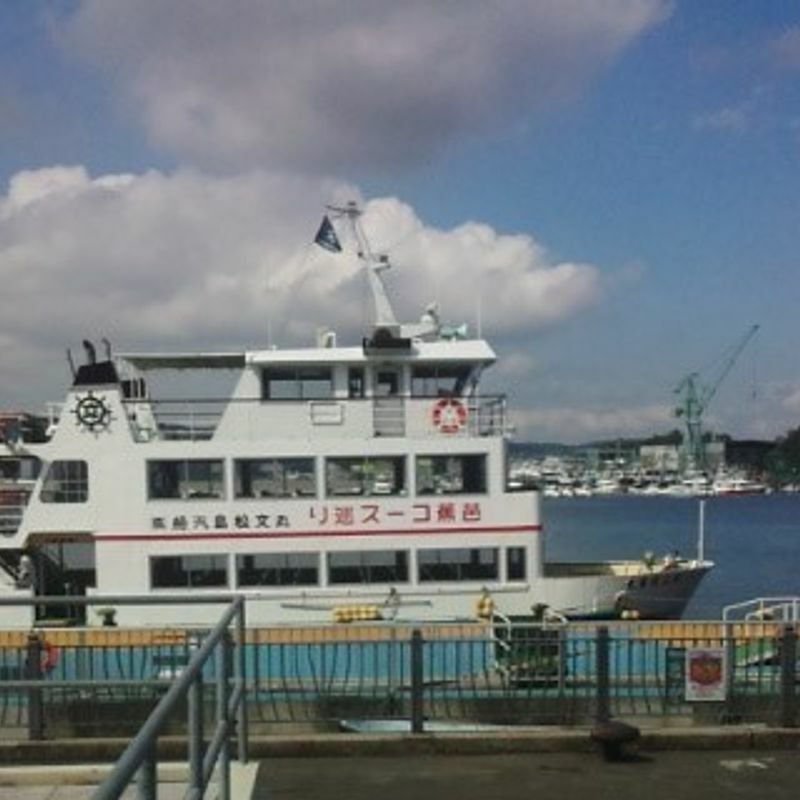 A few minutes later, the Ferry pulls into the dock at Matsushima. 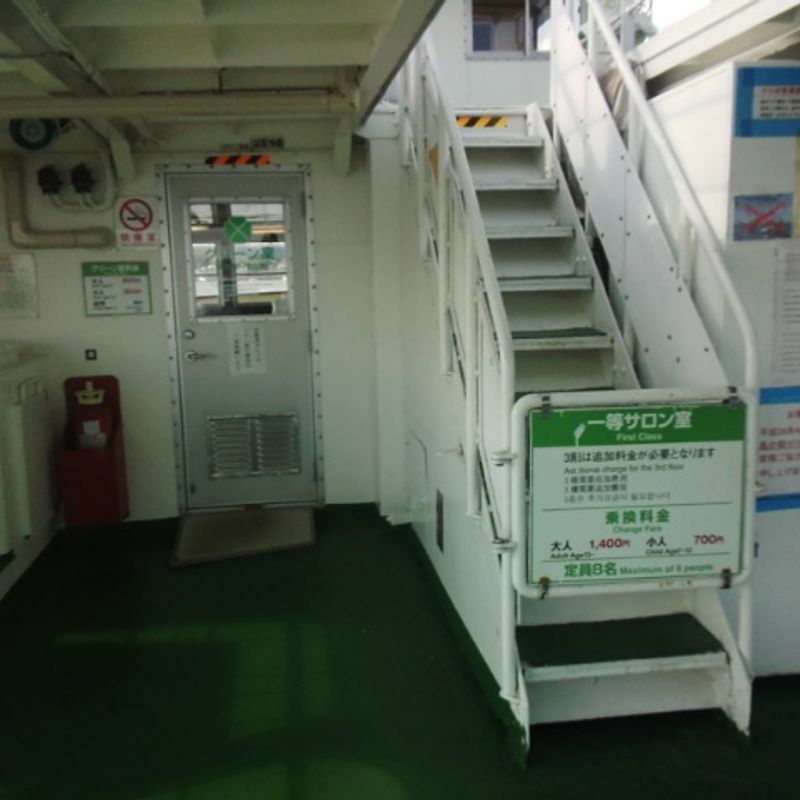 Disembarking, you'll find a rest-house with vending machines, restrooms, and an air conditioned waiting area inside on your left. 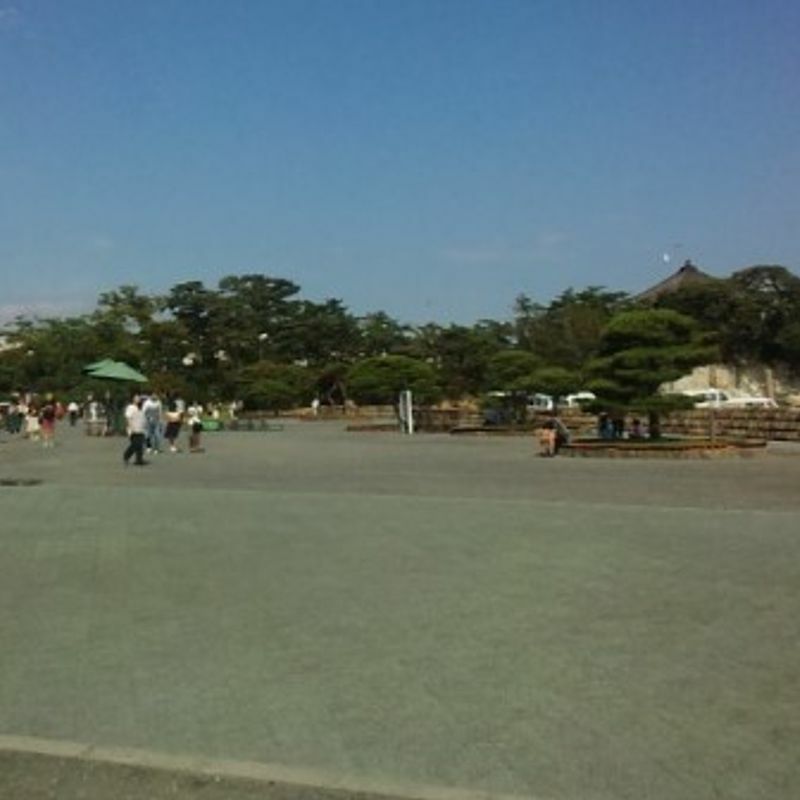 To the right is a large open area, sometimes used for festivals. Feel free to sit in the shade of a pine tree before continuing on your way to explore the city. 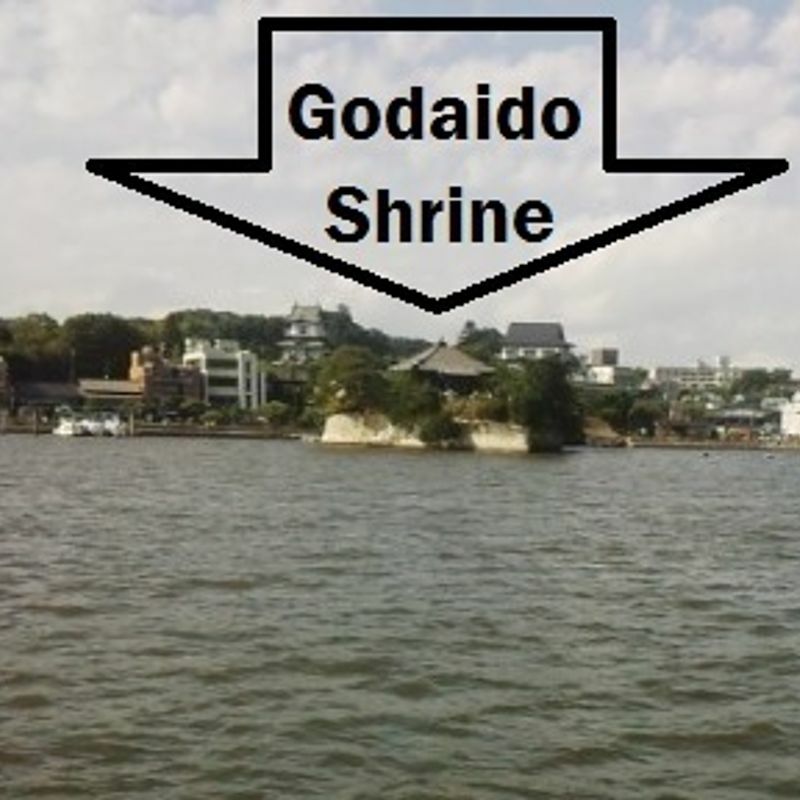 Past the open area, you'll find Godaido, the shrine that is visually synonymous with Matsushima. It boasts a great view and is completely free to enter. 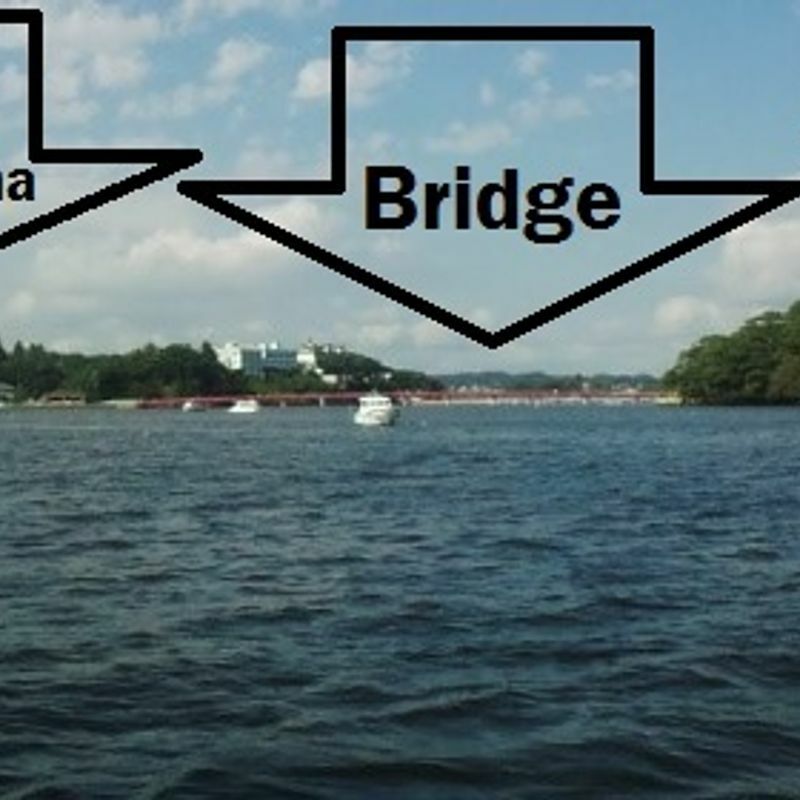 Whichever way you choose, have fun and enjoy your time in Matsushima!